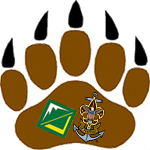 Kodiak Challenge is an adventure that will push the boundaries of Scouts in crews and ships who are ready for a leadership challenge. Venturers and Sea Scouts will be encouraged to try new things that may be out of their comfort zone. It is an experience—but one that has its underpinnings in the application of the leadership skills they learned in the Introduction to Leadership Skills for Troops (ILST) or Crews (ILSC), National Youth Leadership Training (NYLT), and/or National Advanced Youth Leadership Experience (NAYLE). It is, as is all of Scouting, an adventure with a purpose. The Kodiak Challenge is taught by older/more experience unit youth leaders to give participants experience in values and vision, effective teams, communication, decision making, and planning. The Kodiak Challenge is open to registered Scouts ages 14-20 in a crew or ship who are looking for an opportunity to grow personally. Venturers are expected to strive to achieve the above aims while living the principles of the Scout Oath and Law. The cost for each Scout to attend camp is $295. Registration can be completed individually by parents or the crew and ship can register together. Adult leadership from the unit is not required for participation. Staff applications are being accepted; please e-mail the camp registrar for more information. All participants are required to attend a pre-camp meeting which will include an Introduction to Leadership Skills for Crews (ILSC) and a planning session. The participants in the adventure have a critical role in planning the Kodiak Challenge. Planning is a critical leadership skill, and each participant needs to play a role in planning for the success of the challenge. Participants will learn far more if they have ownership of the process from beginning to end.